It began with the forging of a great friendship. For three months, Lydia Bell has watched Craig, her best friend and the love of her life, be in a happy relationship with someone else. But she’s over it. Or thinks she is until she hears Craig’s voice on the phone. Desperate to put her romantic feelings behind, she joins her roommates for a night out. Maybe she’ll meet someone. And meet someone she does—a guy named Scott, who looks a lot like Craig. Despite their awkward introduction, flaming arrows fly, and soon Lydia is running off the dance floor to get away from feelings she shouldn’t have. So much for getting over Craig, and so much for Scott. One Fling to Rule Them All is the second book in the Game of Love series/duology (?). I did not read the first book, but One Fling to Rule Them All is a companion novel and centers around a different character so I gave it a go. Also, I am not a fan of the title and the cover but the synopsis sounds interesting, so I still accepted the review request. Short, yet an entertaining read. It's only ~170 pages but I was able to get into the whole story and relate to the characters. To others, the plot may not be really unique, but I've actually never read anything like it before. Moving-on stories I usually read are those of moving on from a deceased partner or loved ones, but never from a best friend and because of an unrequited love. The plot may be familiar, yes, but I liked how the events unfold for the characters. I think no scene was wasted as they all connect to the characters and their developments. Other things the author incorporated to the story, which I think brought a somehow refreshing take to it, are gaming (RPGs and stuff), and LOTR references. Granted, I don't know anything about gaming and I know little of LOTR (hey, don't judge!) but I was still able to enjoy the story with only a few question marks on my face. Haha! The ending is, thankfully, a good one. It was quite hurried, in my opinion, but nevertheless, I liked how the loose threads were tied together in the end. Plot-wise, One Fling to Rule Them All is an enjoyable read. Scott was not explored well. But despite the one-sided POV, I was still able to understand him. The other characters, like Scott, weren't also explored well. But I liked how they played parts in Lydia's development. I liked the dynamics and relationships between the characters. The writing style of the author is okay. The flow of events is smooth and I did enjoy my reading experience, even though I did not read the first book in The Games of Love series. I liked how the author was able to reintroduce the characters and the events that happened in the past without the whole story being complicated and long. However, I did not understand some geeky references. And as I've mentioned previously, I felt like the parts toward the ending is quite hurried. One Fling to Rule Them All is told in a first person perspective, in Lydia's POV. Despite the limited view, I was still able to connect not only to the main character but also to the secondary ones. 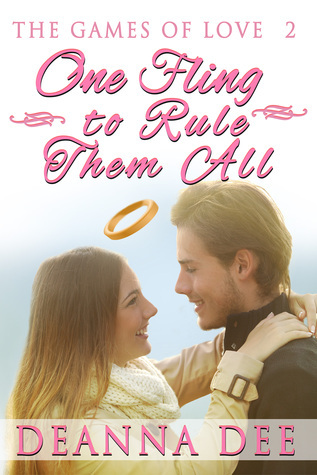 Overall, One Fling to Rule Them All is a light, fun read about love and about moving on. It's a quick read that fans of contemporary romance and LOTR/gaming will surely enjoy. Disclaimer: I got a free copy of One Fling to Rule Them All from the author in exchange for an honest review.